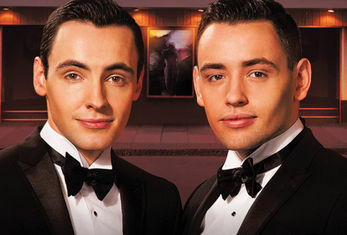 Following their debut sell-out tour playing to more than 15,000 people and wowing the nation with their extraordinary harmonies on Britain’s Got Talent, sensational Welsh singing brothers Richard and Adam bring their UK tourto Bradford, St George’s Hall. Performing a selection of silver screen favourites including Somewhere from West Side Story and Moon River from Breakfast At Tiffany’s, the velvet voiced duo will be joined by special guest Sophie Evans. The 21-year-old Welsh beauty is perhaps best known for coming second in the BBC competition Over the Rainbow to findDorothy for Andrew Lloyd–Webber’s new production of The Wizard of Oz at the London Palladium - a role, she would later take over before being asked to perform at the BBC Proms in the Park and making her big screen debut in The World’s End with Simon Pegg. There will also be a special appearance by the Manchester Show Choir who won a competition to perform with Richard and Adam in Bradford. The group will join the brothers in a fantastic rendition of Can You Feel The Love Tonight? from The Lion King, as well as The Impossible Dream and will also get chance to perform one of their own songs. Richard and Adam’s success on Britain’s Got Talent was quickly followed by their debut album The Impossible Dream, which shot to the number one spot in the album charts where it spent four consecutive weeks at number one, making it the longest-running UK number-one album of 2013.